I went up to Phila on Thursday to see Dr. Küsel. He said the teeth were alright and cemented that little gold band onto them. Yesterday it came off; so we thought we had better go up to Phila to day. We got up at six o’clock and had breakfast. Then I went upstairs to ty up my teeth. While I was doing so Nellie came rushing upstairs saying that I had only eight minutes in which to go all the way down to the depot and catch the train. I snatched my hat and rushed off leaving the little gold band behind. When I had nearly reached the depot I remembered it. I turned and ran nearly all the way back to the house as it was immediately after breakfast I had such a pain when I got there that I could hardly stand. I ran upstairs and got the band and started off again; but I was so out of breath that I could not go very fast; so just as I was nearing the depot the train pulled out. We are going to telegraph to Dr Küsel that we are going up tomorrow. Dr Küsel found last time that pulling in the front teeth was pushing out that eye tooth, the one you noticed was so far out, you know. So I have to wear the plate and the band both until that is pulled in. When we went in Thursday, Cousin Margaret and I, we went to see Indepence Hall. There we saw the liberty bell and the declaration of Indepence, or a copy of it and many other interesting things. We also went through the mint; that was very interesting indeed. Then we drove through part of Fairmount park. It is beautiful. Then we tried for the five o’clock ferry but missed it; so we went out to Bryn Mawr and spent the night there. They were very glad to see us and we had a very pleasant time. Uncle Tom seems to be getting along very nicely. He goes out driving sometimes with Aunt Sadie and seems to enjoy it very much. Dr. Christie says that if Aunt Sadie cand keep him as well as he is now she will be doing the most all that is possible. Saturday we, Jessie and I and Will, got up at a little after five and went out fishing. We caught 38 perch and one sun fish. We had them for dinner and they tasted very good. I must close now for they are getting ready to go on an all day sail. Goodbye darling Mamma. Give my love to Grandfather and keep more than words can tell for your dear self. 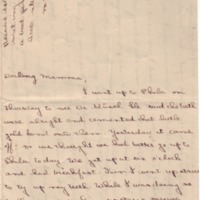 Wilson, Margaret Woodrow, 1886-1944, “Margaret Woodrow Wilson to Ellen Axson Wilson,” 1902 August 11, WWP19534, Eleanor Wilson McAdoo Collection at the University of California-Santa Barbara, Woodrow Wilson Presidential Library & Museum, Staunton, Virginia.